Audials One 2019 Review: Quality Music, Movies, Series & Much More! Audials One is one of the largest streaming music and movie services that is provided worldwide. It offers simple online access to an unlimited number of songs for all the music lovers out there. Audials one captures music from a lot of legit streaming sources like Spotify, YouTube, Amazon music, SoundCloud and Apple music. You get MP3 files free of cost and has an excellent quality for your music library. It is available for all Windows, Android and iOS users. For all the movie buffs there, here's an excellent opportunity for you to save favorite movies and series from Netflix, Amazon Prime and other video streams in the topmost quality. You also get a chance to download live television online. 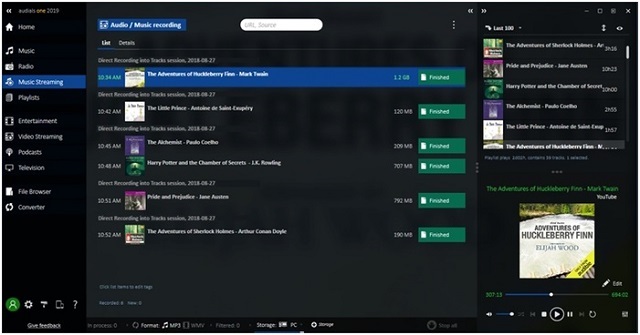 You can create and start your private movie library. 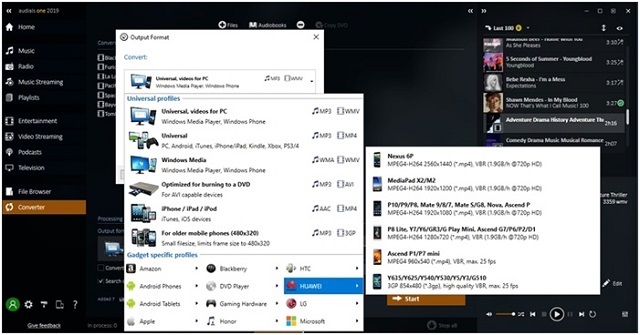 In addition to downloading your favorite music, you can also record music from various legal sources like Spotify, Deezer and other streaming sources. You can download it from YouTube, SoundCloud and other portals like Spotify. You can also record them as a private copy of radio streams; great isn't it? Quality matters a lot when it comes to anything- be it music, movie or TV shows. Audials one ensures that quality is met by saving the track in top quality as MP3, AAC, or WMA in up to 320 kBit/s. The best part about this being lyrics and tags are also made available along with the music. Audials One 2019 is exceptionally fast as it takes only a few seconds to download 10-11 hits right away from YouTube. It records music from Spotify at a speed that is 10 times faster than the standard rate. Audials gives you a variety of music in the world. All the latest hits, albums, 120 genres of music and up to 20,000,000 MP3s at your service. 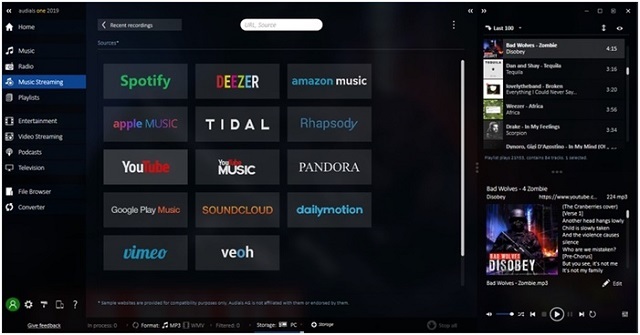 No matter what the music is, Audials One records all the existing versions of streaming services. You can either click to hear them immediately or store them in your music library. You can also follow your favorite artists on Audials One and select the hits or albums of your preferred choice. It finds all the songs of your desired artist and saves them in the background. It's faster and way better than any other software. How's Audials One different from the Rest? 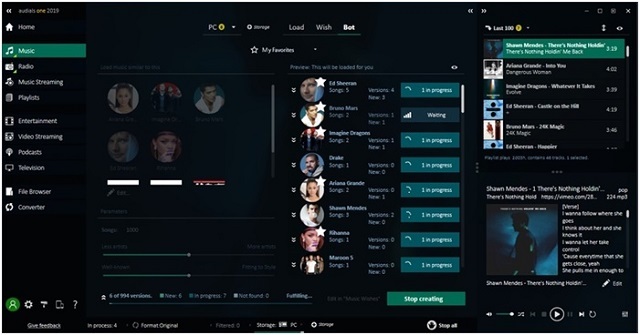 It's now easy to access movies, TV shows, music and internet quicker than ever before through the one and only - Audials One. Audials focuses more on Quality, speed and ease of use. The quality of the recordings from Amazon, Spotify and other streaming services has been improved and Optimized for better music experience. The tracks are cut accurately at the beginning or the end and particularly when high bit recording has to happen, loss of quality is avoided as far as possible. Best quality music is promised to you! It uses Spotify for great quality music and you find a large variety of songs in them. Due to its great features, you get music faster than ever. 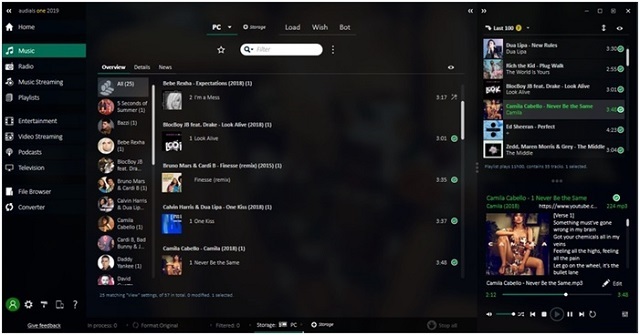 It also offers new editing features and best suggestions so that you get numerous songs of your choice at your disposal. Since Audials uses Spotify as a music search tool, music is delivered to you at its best quality at lightning speed. YouTube and other music portals give you the choice of best qualities of sound in their videos. Audials opts the best possible audio track for you to download from YouTube directly. You have to type your favorite music, genre, radio station or artist name in the search box. You'll be able to find the related music. Audials also provides artists, playlists or tracks that are relevant to your interest. The music search and wish list available in Audials use Spotify apart from YouTube, SoundCloud, etc. This is why it can offer excellent quality music for you to have a nice music journey anytime anywhere. Audials not just lets you scan YouTube, but you also get a chance to download the music directly from the YouTube videos as an audio track by entering the corresponding link. You can record a whole list of YouTube links and Audials will do the job for you. All you need to do is select the source of your desired music and Audials automatically detects all the other information like whether you're recording the music from Spotify or some other software, and which browser is being used to record. It chooses the best settings to make sure the recording is optimum. For all you music lovers, personalized style is created as per your taste by picking a few sample artists or radio stations. When you search for your favorite music or while using wish-list, Audials knows every detail about your choice and provides you with an incredible amount of new artists, radio stations that best fits your interest. As soon as you switch to a different style, the color and music changes. Music: the Highest quality of all recordings, music tracks is ensured. Finds all major music services. Radio: powerful podcast communication is available, supports all main stream types like MP3, WMA, etc. 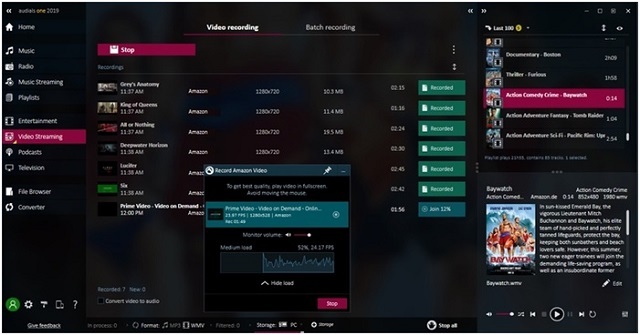 Movies: High-performance video recording technology, perfect for video streams, online movie stores and video sharing services. Copy and convert: creates audio and video files in major formats - MP3, WMA, WMA pro. Converts as many files as you like at the same time. As a whole, Audials One is one of the most reliable tools optimized for maximum video and music quality. It also supports fingerprint based song recognition, automatic selection of your favorite audio track, and recording via the soundcard. It is indeed a fantastic software for the best music experience!